Ideal for heavy, bulk items. Includes 4 high density chipboard shelves, adjustable at 40mm increments. Self assembly required - taps together. 1200mm depth shelves are a cost effective alternative to back-to-back 600mm depth units. Choice of depth and width. 2.5m high bays listed separately. Robust and practical, heavy duty boltless shelving from Slingsby could be the perfect storage option for you. Assembling Slingsby heavy duty boltless shelving is quick and easy - there are no nuts and bolts required during the assembly process, and the high-density chipboard shelves - supplied with the bay - can simply be tapped together. The shelves are also fully adjustable at 40mm increments for extra convenience. 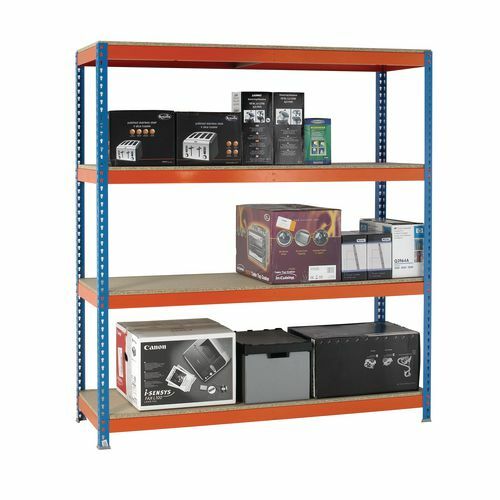 Each bay is sold complete with four shelf levels, while each shelf has a maximum capacity of 400kg. Their durability and generous capacity makes Slingsby heavy duty boltless shelving ideal for storing a variety of large and bulky items.